I Voted – Did it count? For the third consecutive presidential election, I have voted using different technology here in Florida. I showed up at the early voting site and joined my fellow civic-minded Americans in casting our ballots for either Barack Obama (applause) or John McCain (boos) or one of 11 other candidates (huh?). In 2000, we used the punch card ballots – which provided some of the best election memories. 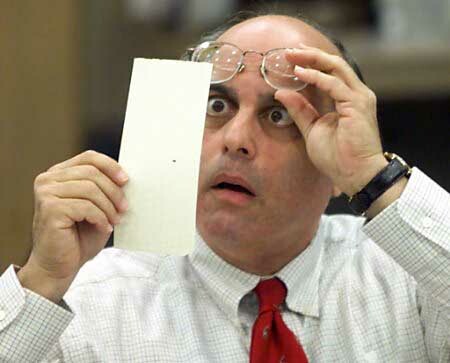 Who could forget the butterfly ballot or the guy analyzing the hanging chads? Who knew what a chad was prior to that election? I thought it was a male name or a country in central Africa. You cannot blame the punch cards for the nonsense of the butterfly ballot which somehow seemed to benefit Pat Buchanan in heavily Democratic Palm Beach County – known for its non-support for Buchanan. The real issue was the chads. There were hanging chads (a piece of the ballot hanging by 1 corner), swinging chads (hanging by 2 corners), Tri-chads (three corners), and pregnant chads (a slight indentation – a dimple, if you will – but all four corners are connected). The chads were completely avoidable if you only took a couple of extra minutes before submitting your ballot. I always did 2 things after voting but before submitting the ballot. I reviewed the ballot making sure the number of the candidate I voted for matched the number on the ballot that had the hole punched. Then I made sure that all of the holes were free of chads. It’s common sense really – which is why I believe it became an issue. In 2004, we were upgraded to touch screen machines. I liked the speed of which I cast my ballot but still wonder to this day who I really voted for. Black Box Voting has proven to be easily hackable (which doesn’t appear to be a word unless you are a computer security person) as demonstrated by Bev Harris from BlackBoxVoting.org. Once you push the button completing your ballot, the selections disappeared from view into a black hole and stored on removable disks never to be seen by me again – thus the name Black Box Voting. The big question was why couldn’t this method of voting produce a paper receipt? I get a paper receipt at the ATM, the gas station and at restaurants. Why not when I vote? So instead of rectifying this situation, these machines were tossed and a new more difficult method of voting was introduced. Paper ballots. Which brings me to my experience yesterday. Oooh, it was so much fun. I showed up at the library promptly at five pm. Fortunately, a cold front (or what we in Florida know as a cold front) was beginning to make its way into the area so temperatures weren’t brutal. For that, I was truly grateful. In fact, it made the mood of my new temporary friends much more pleasant. One older woman toggled between phone calls and listening to music on her phone. I know this to be true because she hummed or sang along when she wasn’t speaking to someone on the phone. One car apparently had an issue parking and slid into a ditch and provided the line with some brief entertainment as he drove around trying to gain traction in order to work his way out. I probably would have called triple-A, but that’s just me. I saw a good number of Obama stickers but none for McCain. I also enjoyed the mental game I play every time I wait in line for an election. Who’s that person voting for? The great thing is that there is no right answer though I think I’m pretty good. As I closed in on the entrance to the building, I was along the wall of the building. Cars occasionally drove around searching for a parking spot. A Honda Accord approached my area and stopped about 15 feet from me – facing me. The engine revved. The driver was an older woman (probably in her 80’s). Her knuckles sat atop the steering wheel. I looked for a place to run – maybe behind a tree. (And yes, I realize that I’m profiling and normally I am against it, but when a car is 15 feet from me and I find myself possibly a moment away from injury, I profile.) Then, I noticed that my civic-minded temporary friends were doing the same thing. So we began sharing our thoughts. The revving continued. The car inched closer. I moved up in line and the tires angled along with me. I was still in the line of site. I adjusted my getaway plan for my adjusted position in line. We discussed and laughed more. Someone pointed at the driver. Moments later, a little girl – about 10 – got into the car and they drove off without incident. And there’s the flaw with profiling. But it did kill nearly 10 minutes. I started wondering how much money I could get if I sold my spot in line to someone who just arrived. Then I wondered how much money I could make by selling my place in line all day long. I’m guessing a couple hundred dollars, especially on the very hot or rainy days. It was now 5:45 and one of the poll workers came out of the building and began the chant that would continue nearly non-stop for 15 minutes. Who was he telling? The people already in line weren’t going anywhere. The people who would be arriving at 6:01 weren’t there yet. But the announcement continued about once per minute. At five minutes until six, I sat down at the registration desk. I handed over my voter’s registration card and my driver’s license. I was asked to confirm my date of birth and my address and then asked to sign the signature plate – which is becoming more frequent at more and more stores. A receipt printed out listing my name, address, party affiliation, ballot type (since early voting allows us to vote anywhere within the county which we have registered. I took my strip of paper and proceeded back outside to stand in a new line. “If you are not in line at 6:00 today, you will not be voting today,” I heard bellowed once more followed by the countdown of 10 to 1. “3 – 2 -1.” Applause. Then I noticed an SUV pulling into a spot. You could tell that the people in line wanted her turned away. It wasn’t even 6:01 yet. What a tough crowd. What would it hurt letting the woman vote? It’s not like she’d vote before them. Now back inside the building, I realized what the next step of the process was. We were waiting for our ballots to print out of 1 of 2 printers. These must have been 2 of the largest printers I have seen. They appeared to be as large as the luggage scanner at the airport. (I did say appeared). You had to hope that your ballot actually came out when it was supposed to come out. Someone in the other printer line was waiting since her ballot did not print out. She was waiting a good 10 minutes before it printed out. I couldn’t help but think that someone got her ballot by mistake. If that was the case, would the 2 cancel each other out? That would mean someone would have gotten 2 ballots by mistake. I don’t know how the system would just not print one ballot. It makes no sense. After my 4 page ballot (front and back) printed out, I moved to yet another line. This is number 3. This time the poll worker stapled part of the 4 pages of my ballot together, verified that my ballot matched the ballot-type I was required to receive based on the original receipt they provided me. She then confirmed that I was who I said I was by asking me. She kept the stapled 4 page portion of my ballot and my receipt. I kept my ballot that was inside a secret folder. I thought the secrecy thing was really bizarre since I was able to read the name of the people in front of me in line as well as their party affiliation, just like I know people read mine. Next, I move to line number 4. It is time to vote. I am the only one in line but have been asked to wait. I get led to the rickety table / booth in the corner. I put down my water bottle and begin to prepare my ballot. I pick up the provided pen only to notice something unbelievable scary. I can not read the ballot. It is a blur. The procedure for this should be relatively simple. Take the provided black pen and completely color in the oval next to the person or answer you would like to vote for. You must completely color in the oval making sure you do not drift out of the lines. Like I said, this would be a simple task, except for the fact that I couldn’t comfortably read the ballot. End of day – check. So here I am. Standing at the voting booth, with a 4-page ballot (front and back) and unable to read the ballot. I looked at John McCain / Sarah Palin and right below it Barack Obama / Joe Biden. Fear started to take over that I would accidentally vote for McCain or Chuck Baldwin. Either that or I’d incorrectly fill in the oval. I started filling in the oval for Obama / Biden only to realize that there is no way I can verify that I am within the oval – at all. So, knowing that I never need reading glasses when the contact is out of my eye, I proceeded to remove one contact from my eye. Immediately upon doing so, I realized I made an enormous mistake. The poor lighting was a huge issue and I couldn’t see the ballot any better without the contact as I could with the contact. I am now beginning to literally sweat. I never felt my civic responsibility would be so stressful. In order for me to see the oval, I needed my eye to be about 2 inches from the paper. My left eye (without the contact) flush against the paper and my right (with contact) tightly shut. Then I realized that I am only in my 40’s. What the hell will this be like in my 60’s? I completed the Obama oval only to realize that I had to do this another 30 times. On deck was my Congressional representative. I found it quite difficult to move my head from name to oval and back again to confirm who I was voting for. It took me more than 20 minutes to fill out my ballot and I went to the polling place with a spreadsheet listing all of my choices. I tried to review my selections realizing that I still can not read them so I only verified that I voted for Obama – Biden and against Amendment 2 – The (so-called) marriage protection amendment. Now I got to proceed to another line. This would be 5 for those scoring at home. 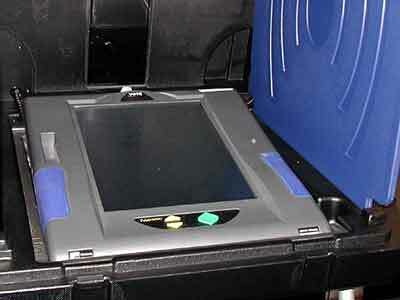 It was time for the ballot scanner. I had both of my contacts in but was still disoriented by the poor lighting and vision problems I encountered. I believe there were 5 ballot scanners. I waited in this line less than 2 minutes. I received instructions on how to feed the ballot into the machine thinking to myself, I know how to work a printer. It more resembled a large fax machine. I fed the first sheet into the machine and saw the message that thanked me for voting and that it was received successfully. I proceeded to insert pages 2 and 3 as I had the first. I attempted to insert page 4, I received a message that my ballot did not insert correctly. The poll worker came running over to me and said your paper jammed. I thanked him for stating what I already knew. He had me push a button which kicked the ballot back to me at which point it was safe for me to insert once more. After the machine thanked me, the poll worker thanked me and gave me my I Voted sticker. I confirmed with him that my first 3 pages were successfully completed even though the fourth jammed. He said that the machine treats every page independently so there would be no concern. I walked out of the polling place and had an epiphany. Why I couldn’t have it 25 minutes earlier is beyond me. I should have called the poll worker over to me and told them that I was unable to see the ballot. I’m sure a magnifying glass or better lighting would have resolved this for me. As I walked to the car, I thought of how foolish I must have looked and wondered if I had taken the longest amount of time to cast the ballot. I then kicked myself for not asking for something to make my life easier and at the same time was proud of the effort I put forth in order to cast my vote. I also wondered what issues would come out about this new voting process and what type of ballot I could look forward to in 2012. I kind of wish they’d bring back the chads. This entry was posted in Barack Obama, Democrats, Election 2008, John McCain, McCain - Palin, Obama - Biden, Politics, Republicans and tagged Campaign 2008, vote 2008. Bookmark the permalink. Fascinating and rather scary account. If you had problems, how many countless others will make mistakes in voting and not even know it? Yikes. I know. I never expected vision problems. When you have to color in an oval, I wonder what it will take for it to reject. How much out of the line? How much white space within the oval? Does it reject in the reader and notify me or am I just S.O.L? I’m usually pretty good at reaching quick conclusions in situations like that but for some reason, I didn’t even think about asking for better lighting. As I mentioned, I verifyed that I voted for Obama and against the gay marriage ban as those were the 2 most important items on this ballot.